Spend 2-hours A Week with Certified Financial Coaches to Learn What the Scripture Really Teaches about Managing All Your Possessions! After lots of requests, we’re happy to announce our Upcoming Live Study dubbed: Do Well: the Biblical Financial Study. A 10-weeks Interactive Study Group stacked-full of exercises to help you apply what you learned and easily overcome all the “holding points” in your financial life. This event is aimed to provide step by step information, advice and tools to get freedom, contentment and economic stability that come from practicing a more disciplined and less consumptive lifestyle. If you’ve been struggling to handle your finances – This is where you discover and learn EXACTLY how to tip the scale in your favor to start living the life that God has planned for you. You get to meet real financial coaches and experts in a group setting and get REAL answers to your SPECIFIC situation and how to turn it around with ease. Our mission is to have you living the lifestyle of your dreams 10-weeks from now! You’ll receive a course manual and a copy of the book “The Worst Financial Mistakes in the Bible” and attend two-hour class per week for ten weeks. 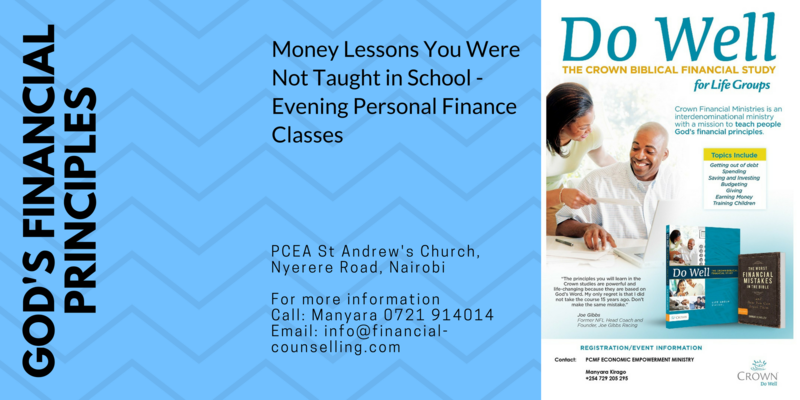 You’ll get a qualified answer to your questions and applicable financial advice to implement for an immediate breakthrough. So do not put this off for LATER because later might be too late as we’ll be closing entry once we reach the maximum capacity. Next Class starts March 13th, 2019, 5.30 pm at St Andrew's Church. So reserve your seat now while you still can.